Hitesh Jirawla founded Cubictree in 2009. He began working from the age of 16 and the motivation came from his US-based uncle who told him that kids of his age gain financial independence soon after finishing school and some even save money to pay for their higher education. This inspired him to the extent that he started selling branded watches to corporates after finishing class 10th and continued this till second year of his graduation. But his parents, like any other, wanted him to focus on his studies and make a career, thus he gave up his sales job and took a year-long break to figure out his next move. Hitesh joined MET, a renowned MBA college in Mumbai and got his degree specialization in marketing. He then started a graphology business with a college friend. For two and a half year, they worked with a range of companies like IBM, Tata Motors, Ispat Industries. But that business didn’t have the potential of scaling up and it was shut down. While Hitesh was on a lookout for another unique business idea, he got exposed to legal system and its working style. He realised that technology can play a big role in making things simpler, remove redundancies from the system and increase efficiencies. And that piece was missing. He thought to himself that India being the largest software exporter, its legal system and records rely heavily on human capital, a resource which can be used for more strategic nature of work in the legal space. Thats when he decided to start Cubictree. The business idea was to develop a range of product and services for enterprises that will make information regarding their litigation available to them at a touch of a button. In the first year, the Cubictree team interviewed corporates, lawyers, court registrars and even judges to gain in-depth understanding of the legal system and what would they like to make things more transparent and accessible to them. After a year-long research, Hitesh was convinced that there is definitely gap which can be filled with the right kind of offering. Thus, he began work on building the first prototype of ‘Litigation Lifecycle Management’ software. 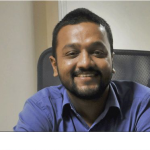 While the product was underdevelopment, Hitesh started approaching corporate clients via traditional sales method (read cold calling) and some he knew informally. It took the company two and a half year to sign up their first client. However, that didn’t come easy. In their first year of operations, they built wireframes based on every feedback from the research. They took the initial wireframes, showed those to the prospective clients, spoke about the benefits, took the feedback and made better wireframes to show to the next client. They physically met more than 100 corporate legal departments, lawyers in courts. Hitesh recalls that almost 90% of the meetings were through cold calls where he reached the legal heads through their board lines and fixed up the meetings with them. The prospects would know the issues they were facing and spoke about that. Since, there weren’t any automated tools available to the legal departments so hearing Cubictree’s idea to bring in efficiencies got them attention from the right quarters. Talking about the issues, a corporate may face, Hitesh says that a case goes on for almost 5 to 30 years. Lots of documents are prepared and saved. This includes lawyers interactions, their expenses which cannot be captured in a spreadsheet or a plain document, as it has limited scope and functionality. This was just a data repository where they can give reports to their top management or government bodies. On the other hand, if an employee from a legal team quits during the case, then by the time his replacement finishes takes the handover, a significant time gets wasted. The Litigation Lifecycle Management provides details of any case starting from its first summon or notice till date. The entire information lies with the organization for life and is available at the click of a button. This kind of automation is unheard of in the Indian context and it has helped clients save lakhs of Rupees every year in legal fees and man hours too. When Hitesh met with prospective clients, they were given a demo of what Cubictree’s product could do. Though, they liked the reports and data that the product generated but Hitesh’s age played a spoilsport in many cases. As he usually met industry veterans with more than 2-3 decades of experience and to them he was a young lad who claimed that he can make their legal system more efficient and their firms more accountable. Another issue was uniqueness of the product. What Hitesh thought was his company’s USP became a concern for some prospective clients. The legal teams saw the results and couldn’t believe that a technology aided product can actually perform complicated legal analyses so easily. Hitesh’s lack of legal background also, made it difficult to crack a client sometimes. Some of the legal heads also raised a concern that why they should go with a new company like Cubictree and not with their existing vendors but the decision was made in Cubictree’s favor every time as their product could do things that no one else had even thought of. Hitesh countered all of these by pursuing clients and adding more capabilities in his product. Surely, the time taken to bring the first client on-board took more than 2 years but the results were impressive and helped them bring more clients on-board. Today, Cubictree works with more than 50 top corporate and banking clients. On the outreach front, the company started with traditional methods like cold calling prospective clients and fixing up meetings. However, they have recently created a channel partner network across the country. Though, some of the channel partners were skeptical about landing clients, given the fact that they had not implemented anything like this and hence the questions dwelled on — time taken to implement, gestation period and what kind of demos and trials they can give to clients to name a few. Hitesh took them through an education process and gave them complete walkthroughs on how the sector works how he sold in the past in form of sales play books. As a result, the first channel partner closed a sale within 3 months of signing up with Cubictree. Cubictree employs around 30 people, currently. They have a development centre in Pune. They have channel partners all over India and have around 40 large legal departments of companies varying across multiple industries such as telecom, BFSI, media, FMCG and pharma. The company is bootstrapped but two investors are also involved full time in the company operations.